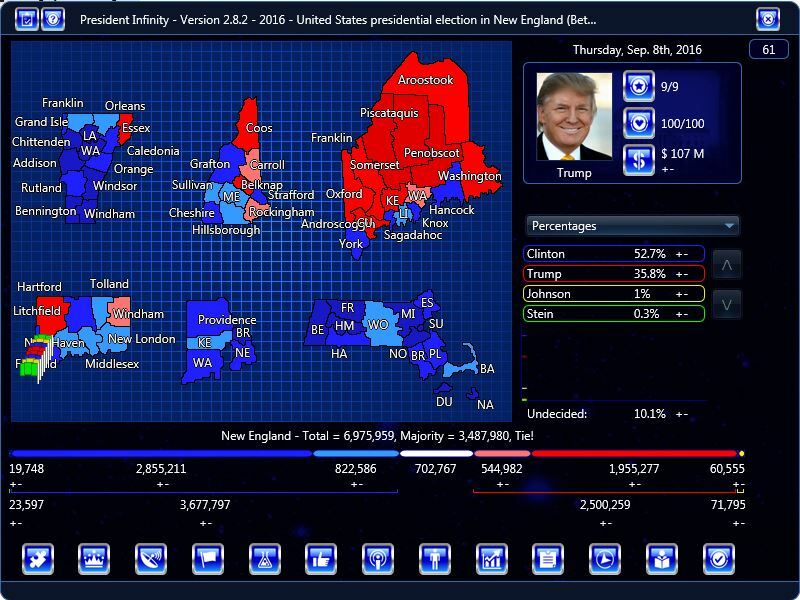 Further to my 2016 Presidential Election in New Hampshire scenario, I decided to expand it to New England as a whole because the 10 counties in NH alone were too few to accurately handle the primaries. 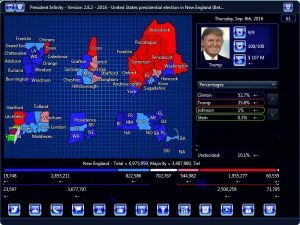 This scenario allows you to battle 2016 in Connecticut, Maine, Massachusetts, New Hampshire, Rhode Island and Vermont with state specific endorsers and accurate polling data for the GOP and Dem primaries (1 delegate per vote cast with 0% cut-off). This entry was posted in 2016 and tagged 2016, President Infinity by Daons. Bookmark the permalink. Looks good. Any chance you could make one for the midwest and other regions of the country? The New York Metro area I think would be a nice scenario. Maybe but unlikely, I’m going to be porting over some of the old Australia scenarios for the new second preferences feature which will be a priority. I certainly wont rule anything out however. Where do you get the counties populations and eligible voter counts from? Great scenario. I usually search on the Secretary of State websites for the respective states, they often have archives of election results and voter registration. For the populations, I found the following website useful for county breakdowns. For non-US elections, the national Electoral Commissions tend to have a good range of election data. Alright, no offense intended but why are the polls wacky aswell as inaccurate? The only state Trump even had a chance in New England was possibly NH, I see how it may be intentional but if it wasn’t meh. I think the issue here might be that the percentages are done by using the final results which will have put Trump a closer to Clinton from the beginning in a number of areas. I cant think of any other reasons for Trump being too strong unless the size of New England at a few million allows for larger vote swings as the counties are quite small and the shift needed to flip counties is only a few hundred or thousand votes.